NOTE: This is a battery float charger/maintainer. If you drive your car once every week or two, you probably won't need this. This is useful to keep settings (radio presets, etc) if you leave your car for weeks at a time without using it, but not required since the LVC (Low Voltage Cutoff) will protect the battery from fully draining. 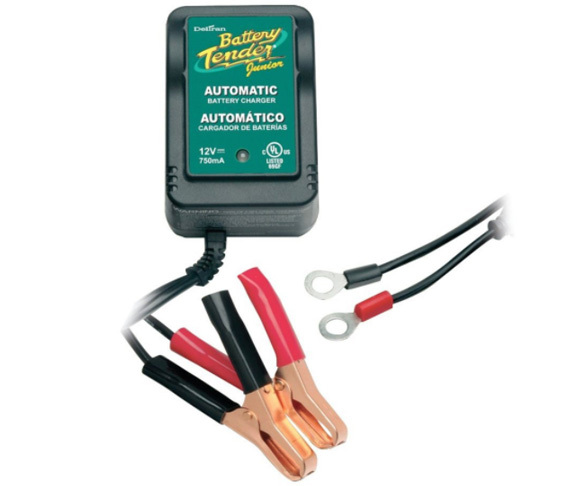 Battery Tender Junior 12V @ 0.75A The Battery Tender Junior is much more than a trickle charger. It has a brain. It's lightweight, compact, and fully automatic; very easy to use, especially in small spaces. It will keep your battery fully charged so that it is ready to go when you are! We stock the 120V vesion only! To order the 220V version, contact your local Deltran distributor in your country. Spark proof during lead connection, reverse polarity protected and includes a 12-foot output cord. Can be used for any 12 volt Voltphreaks lithium battery, AND normal lead-acid batteries also. Notify me of updates to Battery Tender Jr.